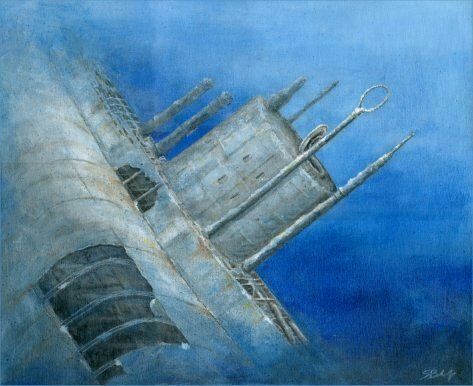 Original picture is acrylic on canvas measuring 16" x 13"
I dived upon this U-boat in 2001 and this was the very first image I saw of her. A fascinating dive. She lies just off the SW tip of Ireland in approx 45 metres of normally very clear water. Although there are many variations on how she sank in 1945 it is probable that she hit a stray mine. All her crew were taken prisoner ashore. If you're a diver - it's definitely worth the trip.